The zero-hours contract cleaner might symbolise the insecure netherworld of a global ‘race to the bottom’ in employment. But trade unions are finding ways to link precarious outsiders with more secure, organised workers. Solidarity or precarity? Flickr / IndustriALL Global Union. All rights reserved. The continuing expansion of precarious work is one of the biggest threats facing unions. It is not only about job security, pay and working conditions but also workers’ capacity to organise and fight collectively for their rights. As demands for flexible labour markets increase, companies are resorting to outsourcing and subcontracting, with precarious work exploding far beyond any legitimate needs. Besides insecurity, precarious workers experience lower wages, limited training opportunities, lower occupational safety and health protection, fluctuations in hours of work, lower social-security and social-protection coverage, limited job mobility and, critically, low or no trade-union representation or collective-bargaining rights. Collective bargaining is one of the most important tools trade unions have for regulating precarious work and the working conditions of precarious workers. But precarious work is often used as a way to undermine union organising and collective bargaining. Trade unions universally face difficulties in organising and representing precarious workers, whose association with a single workplace may be weak and short. Due to the insecure nature of their employment, precarious workers are often afraid to join or form a trade union. In several countries, agency and outsourced jobs are reclassified in a way that legally prevents these workers from being eligible for membership in the union where they work. For workers in triangular employment relationships, bargaining can be almost impossible. The user company where they work controls their working conditions, yet the agency or subcontractor is their legally recognised employer, even though it has no actual control over their work. Outsourcing generates a real risk of fragmenting trade unions’ bargaining power, with single companies contracting multiple subcontracting firms or temporary agencies. Organising precarious workers in an existing union better protects precarious workers and builds stronger unions. This in turn protects permanent workers by preventing division of the workforce into separate, isolated bargaining units. Once the union can show that it is able to bargain collectively on behalf of precarious workers, they will be more likely to join it. In Germany, the major unions have established specific bargaining associations for temporary agency workers, to recruit these workers and to enforce equal treatment in collective agreements. In 2012 the IndustriALL affiliate IG Metall gained 38,000 new members among temporary staff through a strong focus on improving conditions for agency workers. Coverage of sectoral agreements is often high as a result of the number and size of the companies bound by them. Extension requirements under the law may further increase the reach of the agreement. If agreements cover ‘all workers’ engaged in an industry, as opposed to ‘employees’, coverage can be expanded to include workers in precarious employment relationships. In Denmark, unions in industrial production and construction have negotiated sectoral agreements which include protocols on agency work. These state that agency workers must be employed in accordance with the sector-specific agreement, covering all aspects of pay, working time and other important terms and conditions of employment. In Argentina, the oil and gas federation FASPyGP succeeded in negotiating a clause in the gas-industry collective agreement which stipulates that all provisions of the agreement apply equally to subcontracting firms. And in South Africa, NUMSA has reached several industry-level agreements in different sectors (automobile, tyre, metal) that aim to phase out labour brokers and improving the working conditions of precarious workers. Collective bargaining at the level of an individual company is more likely to exclude precarious workers, such as agency and outsourced workers, as they are not direct employees of the user company. When industry-level bargaining is not achievable, bargaining directly with the user enterprise on behalf of both permanent and outsourced/agency workers is the best way to consolidate union strength and fight for equal conditions. In Canada after a six month lock-out at Rio Tinto in Alma in 2012, the United Steel Workers (USW) succeeded in negotiating a collective agreement limiting the use of outsourced workers to 10% of the worked hours. In the USA, the USW also concluded an agreement with the tyre company Bridgestone that restricted the use of outsourced workers for maintenance. This clause has enabled the USW to limit the rate of outsourced workers in Bridgestone operations to 5%. Bridgestone must also consult workplace union representatives on the necessity for, and scope of, outsourcing. Trade unions have also negotiated agreements with temporary work agencies or subcontracting firms that are recognised as the legal employers. In the Chevron-Uni Thai plant (assembling offshore oil and gas platforms) in Laem Chabang, Thailand, two groups of workers supplied by different agencies managed to reach agreement with both agencies. Until then the workers had not been covered by a collective agreement and did not benefit from any rights. A better alternative to negotiating with individual agencies or contractors is to conclude agreements covering the entire temporary-staffing industry in a particular sector. While negotiating with agencies at national or sectoral level has delivered some important outcomes for agency workers, this has largely been restricted to unions in Western Europe. Such agreements are only possible where there is significant union strength among agency workers, where collective bargaining is well protected by the law and it is well institutionalised. Global Framework Agreements (GFAs) provide an opportunity to set agreed limits on precarious employment through global-level negotiations with companies. The GFA between IndustriALL and GDF Suez holds great potential for limiting precarious work. In it GDF Suez recognizes the importance of secure employment for both the individual and for society through a preference for permanent, open-ended and direct employment. GDF SUEZ and all sub-contractors shall take full responsibility for all work being performed under the appropriate legal framework and, in particular, shall not seek to avoid obligations of the employer to dependent workers by disguising what would otherwise be an employment relationship or through the excessive use of temporary or agency labour. 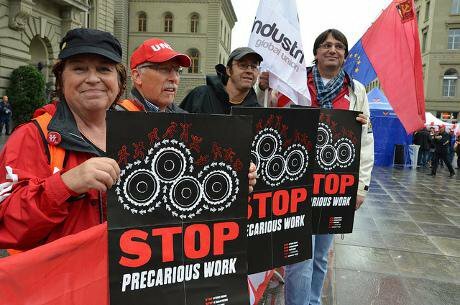 Setting limits on precarious work is crucial, since the more precarious work takes over, the smaller and weaker the bargaining unit becomes, making such agreements impossible in the future. Some unions, including NUMSA in South Africa, are succeeding in concluding agreements that forbid or phase out the use of labour brokers in entire sectors. Other agreements stipulate that unions will be consulted prior to changes that could affect the employment status of employees, and include tools and rights to monitor outsourcing processes. In Canada, the agreement that settled the dispute at Rio Tinto Alma establishes a committee on outsourcing, comprising equal numbers of union and management representatives, which examines and makes recommendations on outsourcing proposals. In Brazil, the tyre union Sindicato da Borracha da São Paulo signed agreements with tyre companies (Bridgestone, Pirelli, Goodyear) which regulate the working conditions of direct, fixed-term workers. The agreements stipulate that temporary workers should not represent more than 5% of the workforce involved in production. In 2012, IndustriALL signed a global agreement limiting temporary work. The ground-breaking ‘Temporary Work Charter for the Volkswagen Group’ sets principles for use of temporary work in the entire Volkswagen Group worldwide (Volkswagen, Audi, Seat, Skoda, Rolls-Royce Bentley, Lamborghini, Auto-Europa). The agreement states that temporary work should not exceed 5% and allows unions to monitor the proportion of temporary agency workers. IndustriALL affiliates have launched several campaigns to regularise workers. In Senegal, SUTIDS negotiated the regularisation of 450 temporary workers, after negotiations with employers in six chemical and pharmaceutical companies: SATREC, SIPS, SIVOP, SPN, SYBEL and NDIAMBOURS. Moving agency workers into direct and permanent employment is not always possible. Therefore unions try to convert agency work into direct temporary work as a first step. This often already allows the agency workers to join the unions and be covered by the collective agreement. In Malaysia, trade unions in the manufacturing sector had applied to represent outsourced and agency workers, but the ministry of human resources rejected the application, arguing that the union was not competent to represent service workers. In response, the Paper Manufacturing Employees Union negotiated the regularisation of outsourced and temporary workers at Kimberly Clark Malaysia to direct, fixed-term employment, so that these workers became entitled to the terms and conditions of the collective agreement. Bargaining for equal pay and conditions between precarious and permanent workers has the dual benefit of eliminating discrimination and combating social dumping. In many cases, IndustriALL affiliates have been able to negotiate equal pay for equal jobs. The extension of the terms of a collective agreement in a particular sector or industry to all workers can also have a significant levelling effect. Besides basic wages, pay includes allowances, seniority and other bonuses to which precarious workers may not have access. Equal treatment goes beyond pay to include access to social benefits, holidays, working hours, health and safety and training. Measures aimed at controlling and limiting the use of precarious work must be well designed so that they do benefit precarious workers, rather than resulting in them becoming more insecure. In the Netherlands, FNV Bondgenoten found that putting the right to a permanent job after a shorter period into a collective labour agreement could have the opposite effect, with employers firing agency workers earlier. It now also focuses on obtaining better wages, pension rights and training opportunities for agency workers. Studies since the 1990s have shown that precarious workers experience greater health-and-safety risks than standard, permanent and direct workers. Agreements which give trade unions access to the commercial contracts between the user company and the subcontracting company enable them to monitor the working conditions of outsourced and agency workers and to ensure better protection of their health and safety. Following the deaths of two contract workers from Romania in a fire which completely gutted the house provided by their employers, IG Metall signed a collective agreement in 2013 with the German Meyer Werft shipyard, which extends ‘co-determination’ to contract workers. The two victims were employed as contract workers by SDS, a recruitment agency for the shipyard which provided workers with deplorable living and working conditions. The agreement stipulates that worker accommodation must comply with the relevant standards. A ‘subcontractor agreement working group’, comprising equal numbers of management and worker representatives, was established to monitor compliance. Non-compliance is subject to penalties, including termination of the subcontractor agreement. Women workers are disproportionally affected by precarious work. Where employment rights are linked to length of service, precarious female workers may fail to qualify for maternity leave, since they are likely to have shorter lengths of service. Sectoral agreements extended to temporary workers can enable women to secure access to maternity-leave rights. In Senegal, SUTIDS has already achieved the regularisation of hundreds of precarious workers, the majority of them men. The union is now bargaining for the regularisation of women workers and fighting to obtain maternity leave for female temporary workers who have no access to this right. Collective bargaining plays a vital role in limiting precarious work and protecting precarious workers’ rights and working conditions. The victories gained by unions however continue to be challenged by employers. Once agreements have been negotiated, they are not always respected and unions must continue actively to enforce them. When agreements close off access to precarious work in one area, employers find new ways to avoid secure employment. And when agreements come up for renegotiation, unions have to fight again to keep the gains they have already won. To be most effective, collective bargaining must be combined with other strategies to fight precarious work. This includes organising precarious workers, building unity between precarious and other workers, raising awareness among workers and the general public of the dangers of precarious work, acting internationally and pushing for legislation that puts effective controls on the use of precarious work by employers.